Disgraced African American St. Louis Police Lieutenant Carlo Gabriel wants fiercely to return to the headquarters hierarchy from which he has been exiled to the city's tough North Side. All he needs do is track down the missing husband of the mayor's vivacious press secretary. Instead he unwittingly and unwillingly unearths a morass of corruption, educational malpractice and greed that consigns thousands of at-risk youths to the mean streets of America's erstwhile murder capital. Worse, it's the kind of information that could get a cop killed. Fighting for life and his honor, Gabriel makes chilling discoveries that ultimately lead to a life-threatening and life-changing decision-a choice that could affect not only his own future but also that of the city and its top leaders. Carlo Gabriel doesn't dress like anyone's idea of a typical detective. He wears Italian leather shoes (Ferragamo), a cashmere overcoat, and has a silk scarf thrown around his coat lapels. However, looks can be deceiving because Lieutenant Carlo Gabriel is all cop, albeit one in disgrace. Gabriel hopes that a case with ties to the mayor will be his ticket back to the inside and the upwardly mobile track within the police department. This seems like a simple case of a missing husband, but the more Gabriel digs the more he realizes this case is anything but simple. 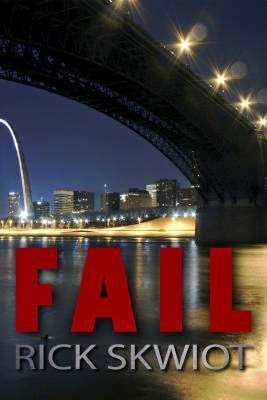 Fail by Rick Skwiot is a story that could be ripped from current headlines as Gabriel discovers a mess that adversely impacts the lives and welfare of large numbers of at-risk youth in the toughest and poorest sections of town. When we first meet Lieutenant Carlo Gabriel, he is waiting to meet the mayor's press secretary. Ms. Cantrell needs to report her missing husband but wants the matter dealt with in a quiet manner. Gabriel is a little suspicious that this woman's husband has been missing for three days, but he's tired of being in disgrace with the powers-that-be; if this case is what it takes to get back in, he's more than willing to handle it as discretely as requested. Gabriel quickly learns the Ms. Cantrell's husband was a doctoral student, an adjunct professor, and that he was fired. As Gabriel continues his investigation, he unearths information that will disturb the powers-that-be. This information could end not only his career but his life. I found Fail to be a quick and enjoyable read. There were times the story seemed to drag a bit, but this never adversely impacted on the likeability of the story. Mr. Skwiot has captured the political side of being a police officer. He also provides a fascinating glimpse into the poorer and neglected sides of a great city. Although Gabriel is being "punished" due to charges of excessive force, he also knows that he is lucky to still be on the force. He might not like being on the North Side of town, since it means he is no longer in the thick of things at police headquarters, but he isn't willing to do shoddy work to please or appease anyone (even his erstwhile friend, the mayor). Fail is much more than a story about the haves and the have-nots; it is a story about good triumphing over evil, greed, and corruption. Gabriel may not appear heroic, but he definitely performs heroic feats to ensure truth and justice prevail. If you enjoy reading suspense thrillers then you'll definitely want to add Fail to your TBR list. Use the Rafflecopter form below to enter the giveaway for one print copy of Fail by Rick Skwiot. Winner will be chosen at the conclusion of this tour. Disclaimer: I received a copy of this book free for review purposes via Partners in Crime Tours. I was not paid, required or otherwise obligated to write a positive review. The opinions I have expressed are my own. I am disclosing this in accordance with the Federal Trade Commission's 16 CFR, Part 255: "Guides Concerning the Use of Endorsements and Testimonials in Advertising." Thanks so much for sharing your thoughts on this thriller with us. Sounds like an intriguing read! Thanks much for the great review of my novel, FAIL. As you state, the story could have been ripped from today's headlines. Recent events in St. Louis--such as the police shooting of a suspect in Ferguson, Missouri--coincidentally mirror those in FAIL, which was going to press as that story broke. But the story of corruption and breakdown of institutions there that I deal with in the novel is not new.